“Dump the losers”: Where do District and City leaders really stand? How shocked should we be really? On Friday, Philadelphia School Partnership’s Mark Gleason embraced a stunningly blunt description of the District’s “portfolio model” at a session of the American Educational Research Association’s annual meeting. Gleason was attempting to explain why the portfolio model depends on school closings in a system where multiple operators run schools. “So that’s what portfolio is fundamentally. … you keep dumping the losers, and over time you create a higher bar for what we expect of our schools,” he said. The audience of researchers, according to attendees I spoke with, expressed visible dissent. A group confronted Gleason afterward about everything from the “losers” framework to his dismissal of funding as a major source of the District’s struggles. The crude phrasing even made Superintendent William Hite recoil, and Hite quickly distanced himself from Gleason’s remarks. But no matter how uncomfortable Hite and others felt about Gleason’s words, they aptly characterize the portfolio model mentality. More important, they describe what is actually happening in the District. If District and city leaders take issue, they need to explain how their policies – and the impact of them – are so much different. Since the 2001 state takeover, the portfolio model approach has had us pursuing all manner of negligent schemes from for-profit EMOs (education management organizations) to unfettered charter expansion and online cyber schools. In the last few years – fueled in part by “philanthropic” venture capitalists like PSP – this reckless experimentation has increased dramatically, with enormous consequences for District-managed public schools. Since 2011, the District has closed down 30 public schools and seen its charter population increase by 50 percent. Today, Philadelphia’s charter population (86 schools and 67,000-plus students) makes up 35 percent of the total student body at a cost of $700 million annually – and there’s no end in sight. This year, the District is instituting a de facto parent trigger vote at two public schools that exemplifies the moral bankruptcy of this approach: Convert to charter – a move the District concedes will result in so-called “stranded costs” of up to $4,000 per student – or opt to stay within the District with no promise of additional resources. In other words, the District will sacrifice some $5 million to see a school convert to a charter but won’t spend additional resources if a school remains under District management. Hite has called those costs a “wise investment.” I call that an abdication of your mission. District and city leaders may not like the word “losers,” but they have employed some pretty extreme language themselves in defense of this model. Deputy Superintendent Paul Kihn recently wrote a journal article titled “Innovate or Perish?” in which he stated that the District was “committed to a set of innovations in infrastructure and service provision to facilitate the development and sustaining of new school models that better meet the needs of all students.” Ensuring adequate resources to deliver quality schools? Not mentioned. School performance is static – unrelated to outside forces like basic funding, staffing, or provision of service. Access relies almost entirely on movement – forcing students out of some schools and into others. 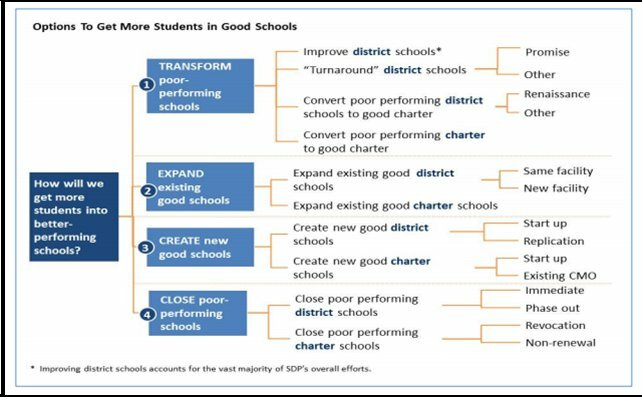 Investment is solely on the extremes: Good schools must be created or expanded to warrant investment, while poor performing schools must close or convert to charter. Support for or stabilization of middle tier or successful schools is completely ignored. The District has effectively deserted its internal turnaround model of Promise Academies. 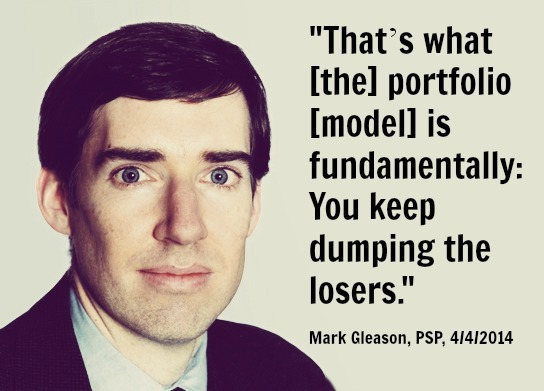 So whether or not they like the phrase “keep dumping the losers,” the District and City’s refusal to prioritize putting appropriate resources toward schools and their latest policy regarding struggling schools – basically, charter conversion or closing them down – is effectively the same thing as what Gleason is saying. Meanwhile the basic functioning capacity of our schools has fallen apart. Every single District school has now fallen into the “losing” category as far as resources go. According to court filings with the state Supreme Court, the District has lost 4,220 staff members this year alone, and is down nearly 8,500 staff members since 2011. The impact on our schools has been devastating. This year was the most chaotic school opening since the state takeover – massive overcrowding, 100 split-grade classrooms in elementary schools, libraries shuttered, the tragic asthma death of a 12-year-old student whose nurse was assigned elsewhere that day, and schools completely bereft of resources. Bartram High School has been a poster child for the consequences of this neglect – leadership upheaval, reports of school violence and chaos, and last month, a staffer whose skull was fractured in an assault. What’s not mentioned so much: Bartram has lost one-third of its staff since 2011. It’s gone from 148 employees down to 101, 91 teachers to 63, four assistant principals down to one, 32 assistants and aides down to 22. What educator thinks this happens with zero impact and consequence? What’s outrageous about the portfolio model is that it’s purposefully indifferent to “details” like funding and staffing shortages. We have to start asking: Are our schools being set up to look like “losers”? If District officials are so offended by Gleason’s comments, why do they continue to allow him and PSP to control and influence private meetings of the Great Schools Compact? For two years now, Gleason and PSP have remained a driving force behind this agenda through the Compact, which brings together select providers in private meetings with the Pennsylvania Department of Education, the Mayor’s Office of Education, School Reform Commissioners, and top District officials. Compact meetings are not announced in advance and are not open to the public. There are no parent, student, or teacher representatives to the Compact. As fiscal agent and staff to the Compact, Gleason and PSP have unprecedented access to press an aggressive agenda around school reform. Gleason’s latest comments, coupled with his unlimited access to policy and decision makers, serve as another reminder of why the public lacks confidence in the integrity of District and city leadership. Meetings of the Compact must immediately be made open to the public, and full, unabridged minutes for all Compact meetings should be released. We need to know where Hite, the District, the Mayor’s Office and the SRC really stand on the impact of the portfolio model on our public schools overall. Is Mark Gleason an outlier, or did he simply say publicly what is being said privately on matters of massive importance and consequence to our children, our schools, and our city? 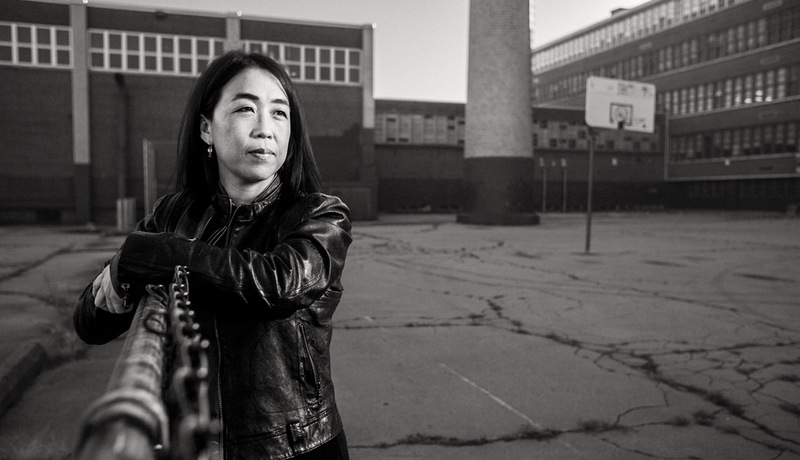 Helen Gym is a co-founder of Parents United for Public Education. This article was cross-posted in the Philadelphia Public School Notebook. Tags: charters, inequity, Mark Gleason, mass school closings, Philadelphia School Partnership, school choice. Bookmark the permalink. There seems to be a lack of awareness and/or indifference to the significance of shifting publicly funded schools to privately controlled school boards. As a Philadelphia public school teacher I feel personally attacked and devalued by the policies of the Mayor and the Superintendent. They seem indifferent to the real and lasting harm done by allowing a decade of children to attend underfunded and under resourced schools. Because they are not actually doing the hard work of teaching, the lives and challenges of the children behind the test scores are vague. What do these men actually stand for? There are so many unspoken complexities that relate to any conversation about public education and school reform. Charters seem designed to dilute the teachers union, which, in turn, undermines the profession. Bashing unions may be popular and have valuable political currency for some elected officials, but the question of what the benefits the labor movement has been, and still is, should be kept in clear focus. Particularly since, as unions have declined in tandem with a shrinking middle class, about 46% of the countries wealth has been consolidated by 1% of the population! Some of the 1% are literally funding the privatizing of education, while imposing their belief that the free market will improve public schools. But what does this mean for the parents of the two schools up for the “de-facto parent trigger vote”? How are these parents being informed, and by who?